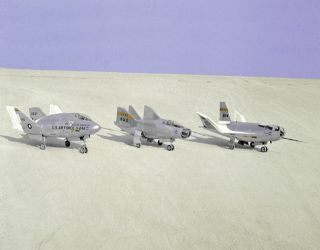 Three wingless lifting body aircraft are sitting on Rogers Dry Lakebed at what is now NASA's Dryden Flight Research Center, Edwards, California. Edwards Air Force Base is a U.S. military facility full of aerospace firsts. It was where the sound barrier was broken, where X-planes eventually flew more than six times the speed of sound, and where the first space shuttle mission landed. Perhaps Edwards' best-known feature is a dry lakebed that dominates the base, which is located in the northwestern Mojave Desert in California. The lake is about 65 square miles, with an unusually flat and hard surface that is ideal for aircraft, according to the National Park Service. The lakebed is a playa, or pluvial lake, according to the base's website, and is the largest such geological formation in the world. The Edwards site was mostly unpopulated desert until the arrival of the Southern Pacific Railroad in 1876, according to Edwards' website. In 1882, the lakebed of Edwards (called Rodriguez Dry Lake at the time) was host to a water stop for the Santa Fe Railroad. "Rodriguez" was later changed to "Rodgers" and then "Rogers." Around 1910, the Corum family settled on the edge of the lakebed and began organizing the scattered settlers. When the Corums opened a post office, the region was called "Moruc," or Corum spelled backward, to avoid confusion with Coram, Calif. The area remained a collection of quiet homesteads until Lt. Col. H.H. "Hap" Arnold saw the lakebed and figured it would be a great spot for aircraft. He established the Muroc Bombing and Gunnery Range in 1933, which was upgraded to a military base during World War II. Combat flight crews trained there in B-24 bombers and P-38 fighter planes. Top-secret airplanes were also tested at Muroc Army Air Base; work that continued well past the conflict's end in 1945. The base underwent a name change in 1949 to honor an airman who died the year previously, Capt. Glen W. Edwards. Quickly, the natural lakebed and the talent of the local pilots attracted high-powered research to Edwards, providing a location where highly experimental aircraft could be tested. All of the United States' first generation of jets underwent testing at the base, according to Edwards' website. Breaking the sound barrier: On Oct. 14, 1947, Chuck Yeager exceeded the speed of sound in an aircraft for the first time. He broke the barrier inside a Bell X-1 aircraft called "Glamorous Glennis," named after his wife. The milestone was kept secret for some time out of fear that the Soviets or others would take advantage. X-plane research: The series of experimental planes (which began with the X-1 that Yeager piloted) has continued for many more generations, with most of the research taking place at Edwards, according to NASA. This included a series of flights to go far as much as six times beyond the sound barrier, culminating in the X-15 program that flew so high that some of its pilots went into space. Landing the space shuttle: The space shuttle was an unusual spacecraft, in that it never flew an unpiloted flight in space. That was the job of John Young and Bob Crippen, two NASA astronauts who tested it out between April 12 and 14, 1981. Edwards was used as a backup landing facility and hosted dozens of other space shuttle landings. The North American X-15 settles to the lakebed after a research flight from what is now the NASA Dryden Flight Research Center, Edwards, Calif.
Much of Edwards' work today remains under wraps due to the secret nature of its mission, but the base's website acknowledges that it has helped with efforts such as the recent wars in Afghanistan and Iraq, and the war of terrorism more generally. One notable program was the single-seater Lockheed Martin X-35, which was tested at Edwards Air Force Base and is now used by the military under the name Lockheed Martin F-35B Lightning II. “The turbojet revolution, the space revolution, the systems revolution and now the unmanned aircraft systems revolution have imposed seemingly insurmountable obstacles. Each barrier, however, has been overcome through a combination of technical aptitude, daring ingenuity and skillful management,” according to Edwards' website.